Peter Hunt, an Agricultural Irrigation Engineer, travelled widely irrigating deserts until he finally settled in Scotland in 1987 where he ran a stock farm for 12 years. The farm has now diversified into equestrian pursuits whilst the bulk of the land is rented out to neighbouring farmers. His interests are classic cars, in particular the Austin Healey, and long distance target shooting which he took up later in life. He has become quite competitive and finished 8th in the World Championships 2009 and 4th in the European Championships 2010. He enjoys tinkering in his well equipped workshop and producing gadgets to make life easier on the farm and is happiest driving his tractor and attending to the maintenance of the farm. His aim is to spend more time on his hobbies and do more travelling. Ann Hunt, a retired Veterinary Surgeon, now mainly spends her time running the Easterton Equine Activities Club. Her interest is in offering opportunities for people to improve the relationship with their horse, be it under saddle or on the ground. Recently retired as Chairperson of British Equestrian Vaulting she passionately believes in the all round value of the sport of gymnastics on horseback. The vaulting horses make excellent schoolmasters and are used for one to one riding lessons. Her other interests are travel, filming and good food! In the year 2001 Ann spent four months away from home on Foot and Mouth duties and was awarded the MBE for her services. Her aim is to grow the Equine Club into a Riding Centre with a difference! She also has the travelling urge and hopes to visit Australia to see her brother before too long. 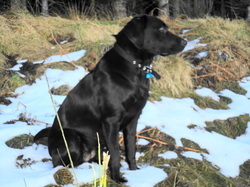 One very lively young Labrador Jenny who is four years old and still chewing everything!